An illustration shows the gas giant orbiting close to a star will starquakes similar to those found in our own sun. A NASA space observatory called TESS has, for the first time, detected a planet orbiting a star with visible starquakes. That's a big deal, both because it shows the capabilities of the newly active TESS planet-hunting satellite and because it allowed astronomers to precisely characterize a newfound "hot Saturn." That exoplanet revealed itself to cameras on TESS (short for Transiting Exoplanet Survey Satellite). TESS, launched in April 2018, is just beginning to show scientists what it can do. Like its predecessor, the Kepler space telescope, the orbiting TESS detects planets by watching the brightness of their host stars dip as the planets pass between the stars and the telescope. Unlike Kepler, the TESS satellite focuses on a group of bright stars relatively close to Earth and spread across a wide span of the sky. (Kepler had a more limited field of view, watching stars farther away.) TESS can also detect starquakes — seismic waves that pass through stars much like earthquakestravel through Earth — by watching more-rapid changes in those same stars' brightness. Starquakes rock every star to some degree, but they're not always detectable. When astroseismologists can spot this phenomenon, though, the stellar shaking offers useful information about a star's mass, age and size. In turn, that information can help astronomers figure out details about the planets orbiting those stars. In this study, TESS data revealed that host star TOI-197 is 5 billion years old and a bit bulkier than our sun — and, critically, just beginning to transition into a red giant (a late stage of a star's life). The planet orbiting this star, TOI-197.01, is a gas giant about the size of Saturn but orbiting so close to its star that its entire orbit takes just 14 days. This world is the most precisely studied Saturn-size planet ever (presumably except for Saturn itself), the researchers said. TOI-197.01, orbiting so close to its star, gets cooked by the burgeoning red giant. 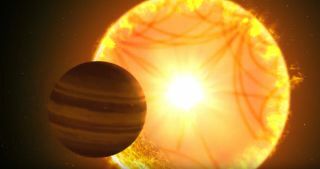 The astronomers suggested that, as the star expands, the planet might puff up from the heat to an even larger size, joining a class of large, low-density gas giants orbiting red giants that Kepler discovered. The paper describing the TOI-197 system is available on the pre-print server arXiv and will be published in a forthcoming issue of The Astronomical Journal, according to the researchers.